BiblioBoard is a free App that gives you access to historical Anthologies that explore places, events, people and themes from across the centuries. 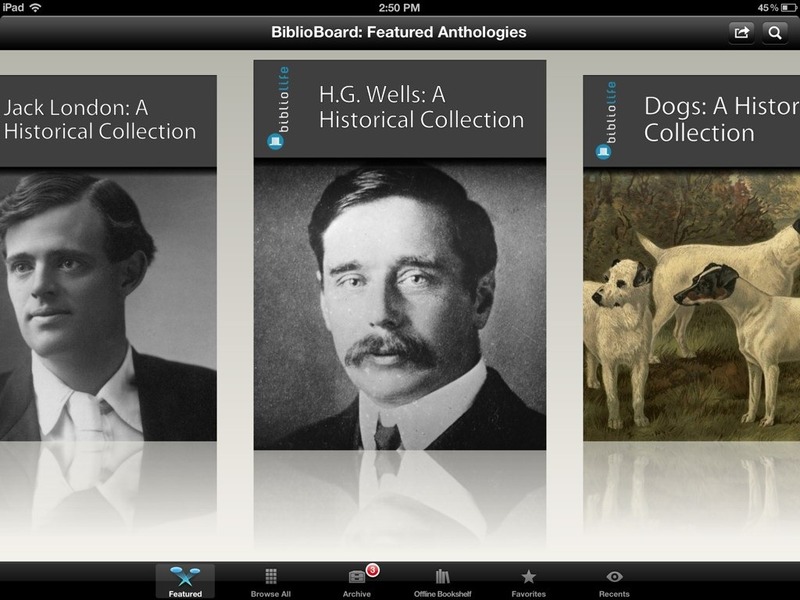 Within BiblioBoard, there are a variety of Anthologies available for purchase. Each Anthology is a curated multimedia experience about a topic that generally includes 75+ pieces of unique historical content such as books, images, articles and historical documents, accompanied by expert commentary. For the price of a single paperback, you get an entire curated universe of historical artifacts. I’ve spent a good amount of time with the app over the last couple of days and I don’t think it lives up to its App Store description. In fact, I think it falls well short of doing so. 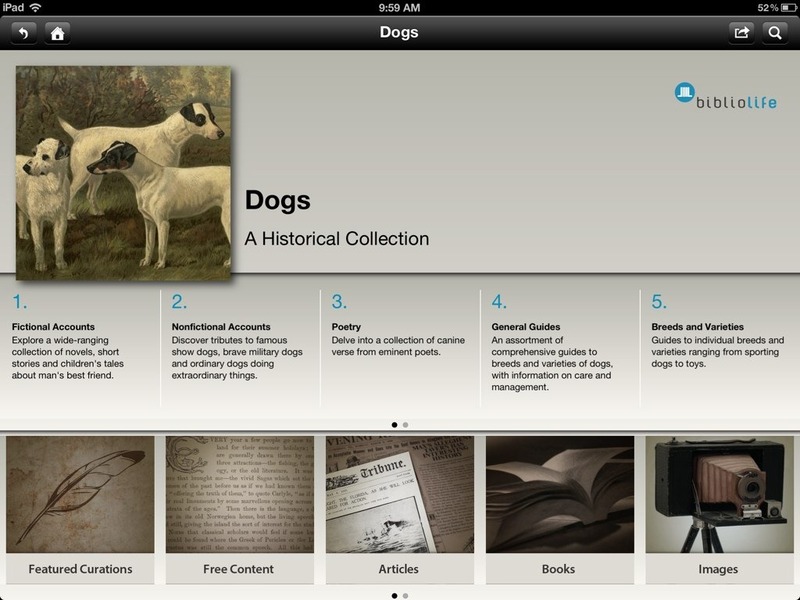 I also think the In-App purchase options, which are the core content of this app, are hugely overpriced. — The App Store description lists Free Content Preview as a feature, but the reality is that the preview mode is extremely limited. It allows you to look at only 7 pages of any book. I found in many titles that doesn’t even get you past a book’s preface section – which makes the preview pretty useless. — Once you’ve viewed the meager 7 pages in preview mode you have to cough up $15.99 to purchase the ‘anthology’ it belongs to. I bought two of these, on two subjects I enjoy – the works of Jack London and ‘Dogs: A Historical Collection’. Neither of them seems worth anywhere near that price. 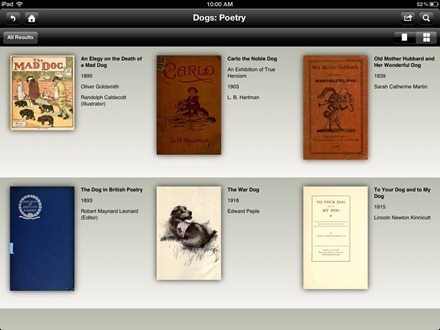 I’ve bought, and thoroughly enjoyed, many iPad apps that I call ‘coffee table book apps’ at similar prices to these anthologies – and the quality of the other apps is just light-years better than what’s on offer here. Books like Leonardo da Vinci: Anatomy are clearly designed from scratch for the iPad, with excellent typography and imagery that makes them a pleasure to read. The content in BiblioBoard looks much more like low-quality scanned in pages. 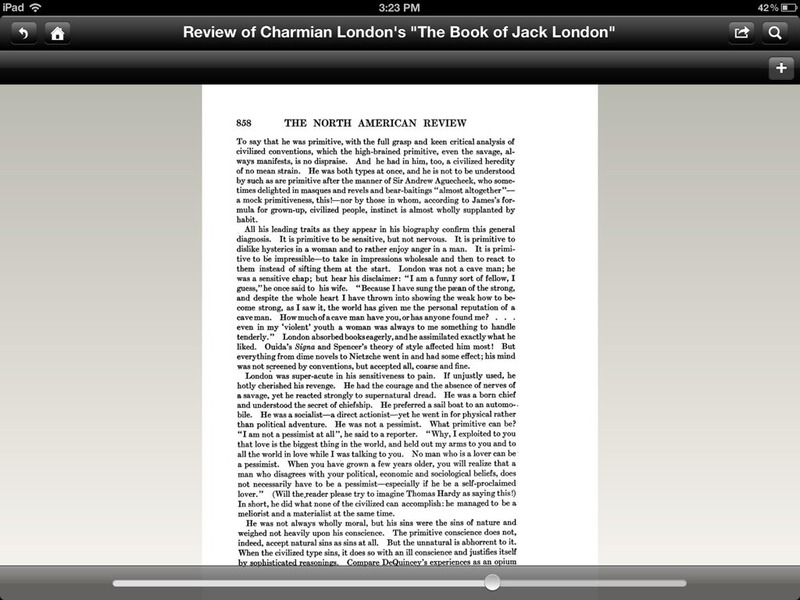 The books within the app often have tiny type that’s hard on the eyes – and basic iPad features like double tap to zoom do not work within the app. When you pinch to zoom the text it leaves you needing to scroll far too much to even read single paragraphs. In short, none of the text or images look optimized in any way for the iPad. And there’s no ability to adjust the font or font size. 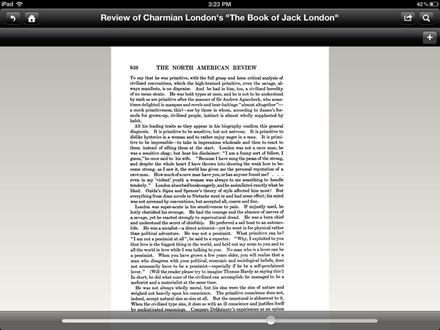 — In landscape mode pages just look silly – with 2/3 of the page unused. And on pages showing individual items within an anthology there’s no summary information or description at all, just thumbnails. There are also no notes or commentary in any of the books I’ve browsed through. 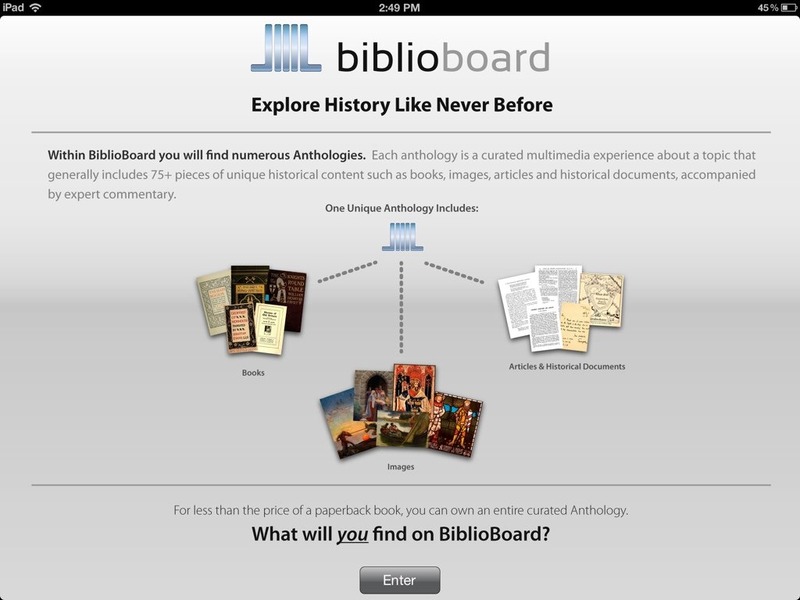 It looks to me like the vast majority or perhaps all the content in BiblioBoard is freely available, public domain material, and the anthologies that are priced at $15.99 each in this app feel far more slapped together than expertly curated in my view. For the $16 that even one of these anthologies costs I’d far rather buy one or more apps that are genuinely optimized and designed for the iPad. 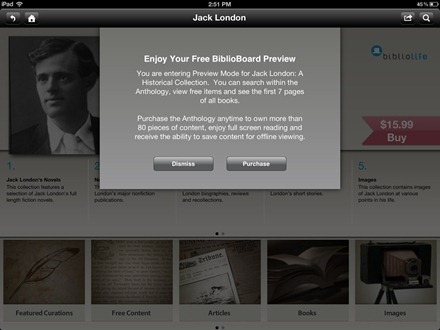 Though I might not find direct matches for the full set of content offered in one of the collections within a single app, I can certainly find most or all of BiblioBoard’s content for free or much lower priced and presented in a way that actually lends itself to enjoying the content. That’s not on offer in BiblioBoard. I purchased the two anthologies mentioned above for the purpose of being able to offer this review, even though I suspected they would not be worthwhile. They more than lived down to my low expectations and I wouldn’t recommend that anyone spend their money on them. The fact that this app has numerous 5 star ratings in the App Store strikes me as more than a little odd. Here’s an App Store link for BiblioBoard; it’s a free app with numerous $15.99 In-App purchases available if you want to go beyond sample content.